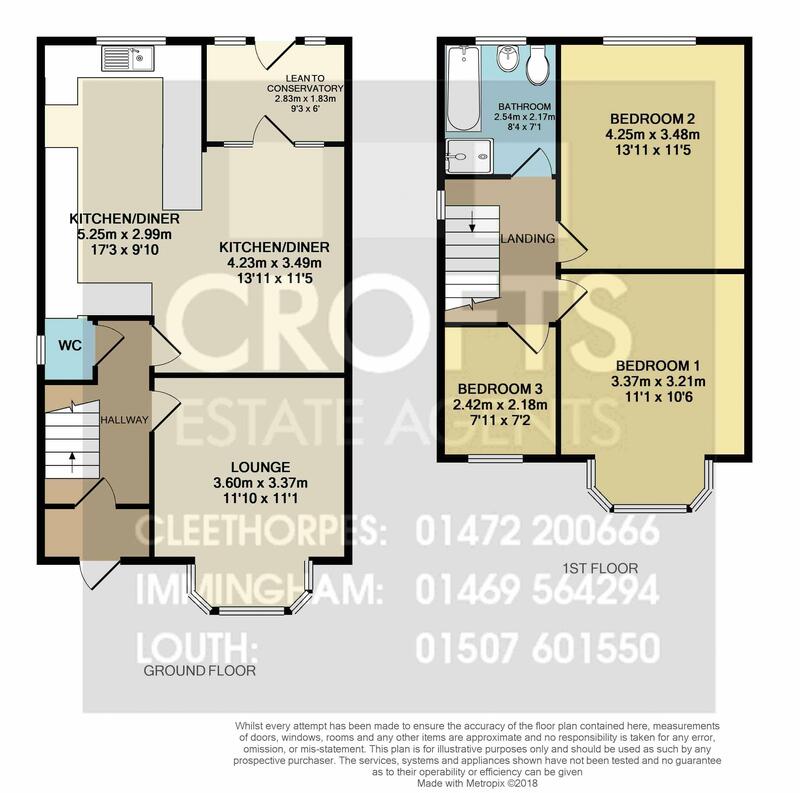 Crofts estate agents are delighted to offer for sale this superb three bedroom semi detached property located within close proximity to Grimsby town centre and nearby to a wide variety of local amenities, Grimsby College and the Hospital. Internal viewing will reveal a modern finish throughout and this lovely home is ready for someone to move into and just enjoy the spacious flowing living space on offer. Internal viewing will reveal the entrance hall, cloakroom and lounge which is positioned in the front of the property. The kitchen-diner area boasts a fantastic range of fitted units with integrated appliances and plenty of space for a table and chairs. There is then a small conservatory which is currently used as a utility room. To the first floor there are three bedrooms, two being doubles and the superb FOUR piece bathroom. Externally to the front there is an abundance of off road parking and then gates open to provide access down the side of the property and lead to the garage and rear garden. The property also benefits from uPVC double glazing and gas central heating. Entering through the entrance porch into the entrance hall reveals coving to the ceiling, a radiator and carpeted floor. The cloak room has an opaque window to the side elevation, vinyl flooring, a WC and wall hanging basin. The lounge has a bay window to the front elevation, coving to the ceiling, a radiator and carpeted floor. There is also a gas fire within a marble feature surround. The dining area has a door to the conservatory, elevation, coving to the ceiling, a radiator and laminate flooring. There is also feature wall paper. The kitchen has dual aspect windows to the side and rear elevation, laminate flooring continuing from the dining area and a superb range of fitted units in a high gloss finish with complimentary tiling. There is also a ceramic sink and drainer and integrated dish washer and fridge freezer. The conservatory which is used as a utility has a door with a window either side to the rear elevation, plumbing for a washing machine, space for a tumble dryer and fitted units. The first floor landing has a lovely stained glass window to the side elevation, access to the loft and a carpeted floor. Bedroom one has a bay window to the front elevation, a radiator and carpeted floor. Bedroom two has a window to the rear elevation, a radiator and carpeted floor. There is also feature wall paper. The bathroom has an opaque window to the rear elevation, tiled walls, a heated towel rail and tiled floor. There is also a superb FOUR piece suite with a vanity basin, WC, bath and shower cubicle with mains operated shower. The garage has an electric door, light and power and a window to the rear elevation. To the front there is off road parking for an abundance of vehicles.